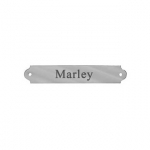 Adorable bone shaped dog tags can be engraved with 2 lines, in 3 type styles, keep your pet safely tagged. Elegantly designed rectangular name plate, in brass with heavy gloss, large size is 3/4' x 4'. 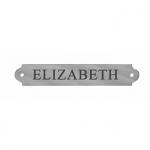 Traditional style beveled rectangular engraved name plated, in brass with satin or glossy finish. Engraved name plated - Price includes 1 line of engraving. 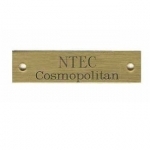 Ornamental Brass Engraved Name Plate 1/2' x 3' with glossy brass finish. 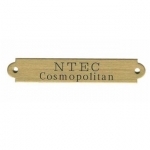 Ornamental Brass Engraved Name Plate 3/4' x 4 1/2' with satin or glossy finish, perfect for fancy halters. Ornamental Brass Engraved Name Plate 3/8' x 2', perfect to attach to those special tack items, like bridles, etc.